It is often desirable to be able to compare two sets of reliability or life data in order to determine which of the data sets has a more favorable life distribution. The units from which the data are obtained could either be from two alternate designs, alternate manufacturers or alternate lots or assembly lines. Many methods are available in statistical literature for doing this when the units come from a complete sample, i.e. a sample with no censoring. This process becomes a little more difficult when dealing with data sets that have censoring or when trying to compare two data sets that have different distributions. In general, the problem boils down to that of being able to determine any statistically significant difference between the two samples of potentially censored data from two possibly different populations. This article discusses some of the methods that are applicable to censored data using Weibull++. 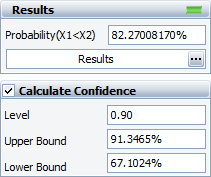 One popular graphical method for making this determination involves plotting the data with confidence bounds and seeing whether the bounds overlap or separate at the point of interest. This can be effective for comparisons at a given point in time or a given reliability level, but it is difficult to assess the overall behavior of the two distributions, as the confidence bounds may overlap at some points and be far apart at others. This can be done easily using the overlay plot feature in Weibull++. The contour plots in Weibull++ allow you to determine if two data sets are significantly different at a specific confidence level. By overlaying two contour plots from two different data sets (analyzed using the same distribution) at the same confidence level, you can visually assess if the data sets are significantly different at that confidence level if there is no overlap on the contours. The disadvantage of this method is that the same distribution must be fitted to both data sets. The following data represent the times-to-failure for a product. Certain modifications were performed to this product in order to improve its reliability. Reliability engineers are trying to determine whether the improvements were significant in improving the reliability. At what significance level can the engineers claim that the two designs are different? The two-parameter Weibull distribution best fits both data sets. 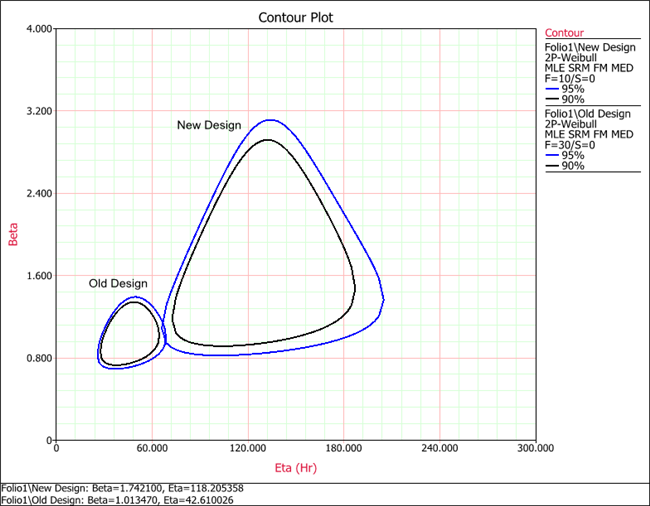 The contour plots were generated and compared using an overlay plot. From this plot it can be seen that there is an overlap at the 95% confidence level and that there is no overlap at the 90% confidence level. It can then be concluded that the new design is better at the 90% confidence level. where f1(t) is the pdf of the first distribution and R2(t) is the reliability function of the second distribution. The evaluation of the superior data set is based on whether this probability is smaller or greater than 0.5. If the probability is equal to 0.5, that is equivalent to saying the two distributions are identical. If given two alternate designs with life test data, where x and y represent the life test data from two different populations, choose the component at time t with the higher reliability. One possible option would be to simply select the component with the higher reliability at time t. However, if you wanted to design a product as long-lived as possible, you would want to calculate the probability that the entire distribution of one product is better than the other and choose x or y when this probability is above or below 0.50, respectively. If P = 0.50, then the statement is equivalent to saying that both x and y are equal. If P < 0.50 or, for example, P = 0.10, then the statement is equivalent to saying that P = 1 - 0.10 = 0.90, or y is better than x with a 90% probability. Weibull++'s Life Comparison tool allows you to perform such calculations. Ideally the same sample size should be used for both products under comparison. If the sample sizes are different, you can use the confidence bounds of the comparison result to consider the effect of the sample size.